It has been such a great summer - I've loved staying home with Marin for the first twelve weeks of her life. But summer is winding down now and I am headed back to work at the beginning of next week. It is definitely going to be hard...am I am not looking forward to it. How have you working mamas out there handled the transition? I'd appreciate any tips you have, I'm going to miss her so much! Anyway, I wanted to share some of the makeup and skincare products that I've used up over the past couple months. Most of them I've liked, but I won't be repurchasing everything. Keep reading to get my thoughts on each item! *All items are from cruelty-free brands and companies unless otherwise noted. I do really like this product...it is hydrating and perfect to use after applying makeup. For someone like me who has dry skin, it helps set my base makeup and gives it an added dewey sheen. The smell is nice, but still mild, and the spray is a fine mist that applies evenly. I used it after every makeup application to keep my foundation from looking cakey or setting into fine lines. I'm sure at some time I will repurchase this spray, but in the mean time, I'm trying out (and loving) this one that is also from Pixi. This mascara was decent...I like the applicator brush and it never got dry or flakey throughout the day. My only gripe was that it didn't give jet black lashes, or provide a buildable application - two things I like, because I like bold and dark lashes. It provided more of a toned-down day time look, so if that is what you prefer, this mascara would be great for you! I definitely got some use out of it, but I won't be repurchasing. If you've been a reader for awhile, you know how much I am obsessed with this. It is, hands down, one of the best cleansers I've ever used - and PERFECT for your night time routine. One side is a solid oil balm that literally melts makeup off your face and leaves nothing behind. The second side is a moisturizing cream that feels so nice on your skin. I've already repurchased, and will continue to again and again. I received this in a gift set for Christmas and it has lasted me a very long time. I found it perfect for traveling, due to the smaller size, and was awesome for morning cleansing in my skin care routine. It has an extremely mild smell and a little bit goes a very long way! I haven't repurchased yet, but I will be once I use up a couple other morning cleansers. I think this brand is owned by the grocery store chain, Kroger. I can't find it for sale online, but I know it is available in stores for less than $10. I was given this unscented version by my mother in a gift basket and it was an okay body lotion. I liked the lack of dyes and perfumes in it, but the consistency was a bit watery - so I wasn't a huge fan of how it rubbed into my skin. I will note that I am unable to confirm if this brand is cruelty-free. 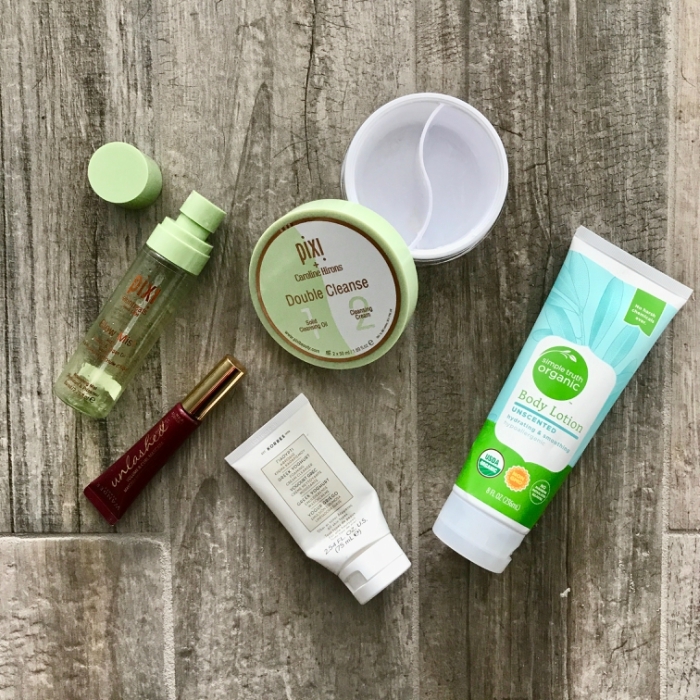 What beauty and/or skincare items have you used up over the summer? I'm always so interested to see what other women use for make-up. I always feel like I have no idea what I'm doing in that department. Half the time I can't even remember to take my make-up off at night. :( That double cleanse stuff you mentioned sounds magical. Maybe I'll give it a shot!